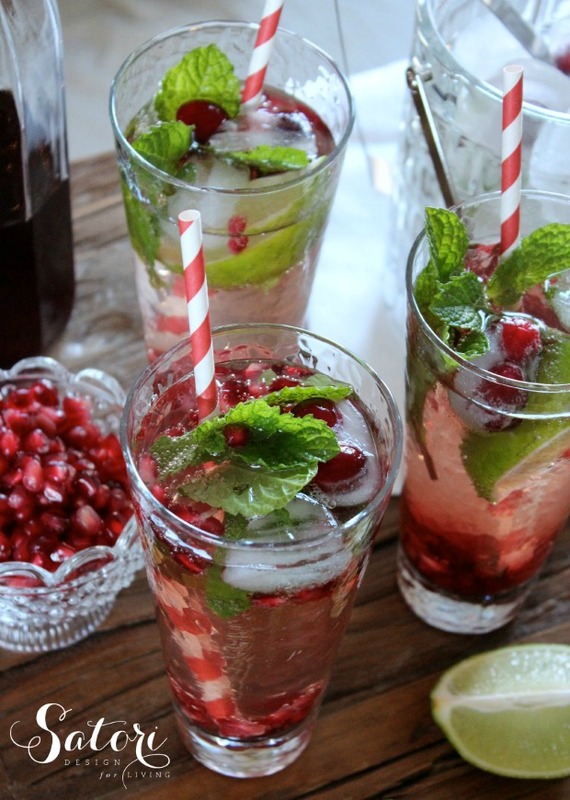 These festive pomegranate mojitos are perfect for Christmas entertaining all season long. Beautiful, fresh and delicious! Every Christmas, I like to come up with a signature cocktail to enjoy with friends and family when they stop by. Of course, the first order of concern is always taste, but the designer in me says it has to look great too. I think my festive pomegranate mojitos do the trick, you? Although cocktails are few and far between for me, mojitos are my go-to. I like how fresh they taste and how you can control the amount of sweetness making them a bit healthier than many other drink options. I like to freeze cranberries and mint in my ice cubes to give our drinks a festive look over the Christmas season. So pretty! You can also make a large batch in a pitcher ahead of time. Add the soda just before serving. Don’t leave the kids or non-drinkers out. These taste great without the alcohol too! These beautiful festive pomegranate mojitos are perfect for Christmas entertaining all season long. Fresh and delicious! In a sturdy glass or jar, add mint leaves, lime juice, lime wedges, honey simple syrup, pomegranate juice and rum. With a muddler or wooden spoon, work to combine flavors (until the mint leaves and limes start to break down). Fill glass half way (or a bit more) with ice. Add pomegranate seeds and top with soda water. Garnish with a mint leaf. 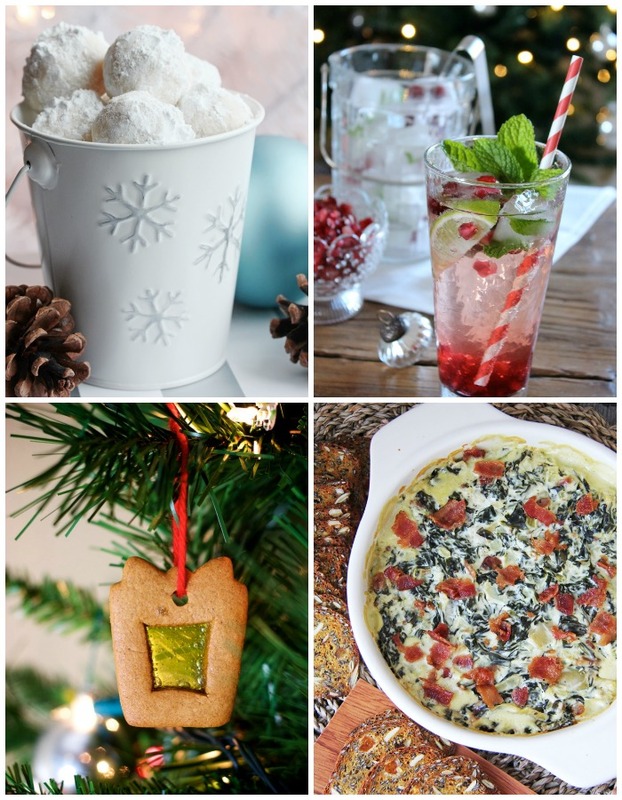 Now check out the Festive Holiday Recipes from some of my friends! 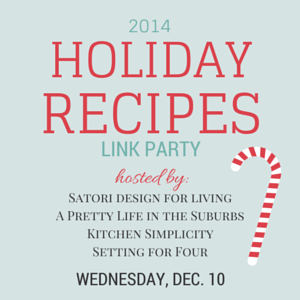 Come back tomorrow (Dec. 10) to link up your Holiday Recipes (appetizers, desserts, mains, drinks, snacks, anything goes…). I’m happy to be hosting alongside some of my friends. I’ll be sharing my favorites on social media all week long, as well as doing a features post next Wednesday. This looks soooo amazing!!! Wish I could come over for one and we could catch up and dish my friend! 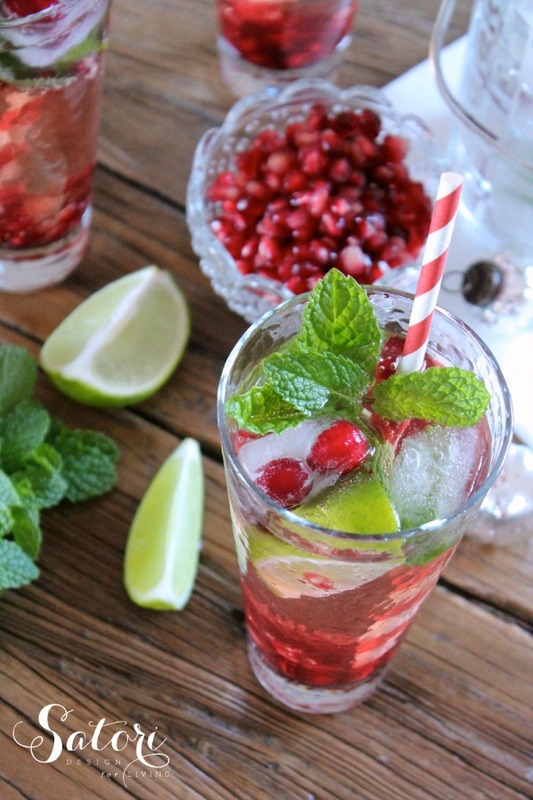 Mojitos are my favorite – love the pomegranate version you created! Thanks for sharing Shauna! That would be fantastic, Heather! I wish more of my blogging friends lived nearby! These sound so refreshing and the colours are so festive! I also love that cranberry ice cube tip – clever. Oh yum. I love that this is a total ‘make-able’ cocktail!! I sometimes see this beautiful drinks then look at the ingredient list and think “NOOOOOPE”. I did the opposite reading your holiday mojito recipe. Lovely! Happy holidays! What a great holiday drink Shauna – it’s so festive and pretty! And looks delicious too! What a fun way to present drinks. I bet it’s good as it looks. So you’ve combined two of my favourites – mojitos AND pomegranate – Will definitely be trying these!!! These look delicious. I may be using this recipe my annual Christmas girls dinner! I agree, it’s better when they look pretty too..which these do! So festive! I had my first mojito this winter, because I had convinced myself that I didn’t like rum – turns out I was wrong! I love that you have a vodka version too. I can’t wait to try it! What a gorgeous and festive recipe! 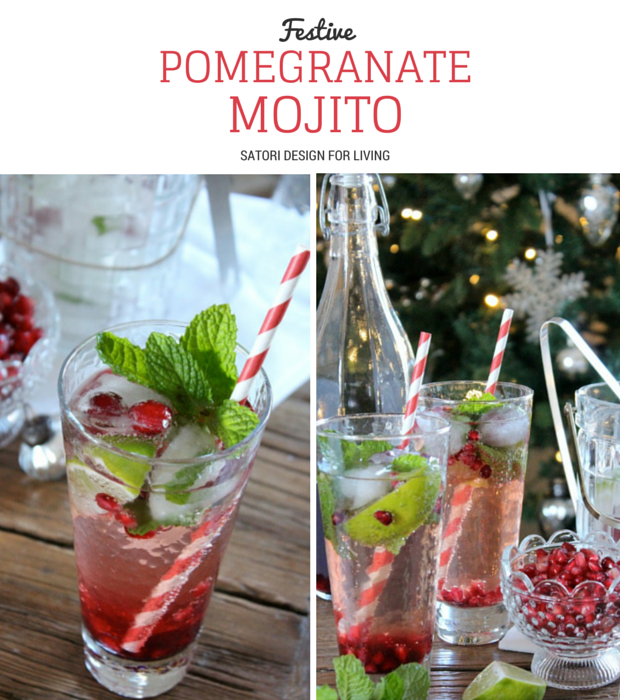 I love pomegranate and I love mojitos so naturally this recipe is calling my name! Ho Ho Ho… I can’t wait to try it! Do you deliver?!? What a great way to turn a mojito into a winter drink- love it!